All Seasons Equipment has access to the widest variety of exhaust equipment in New England. With versatility for all vehicles and facilities we carry fix mounted exhaust as well as rail systems, portable systems and vacuum holster systems for cars and trucks. Our installation team can safely and economically install your exhaust system to your shops specifications. 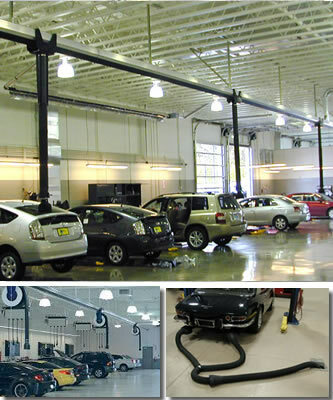 All Seasons offers under the floor, overhead, through the door or through the wall exhaust systems. We have the components that put the system together and keep the system running including telescoping designs, remote start options, longer reaching hoses with your color choice, flexible strap installation and on/off fan controls for each bay. With in-house financing available, All Seasons Equipment is your one stop shop for Exhaust Equipment and installation. Call for more information.